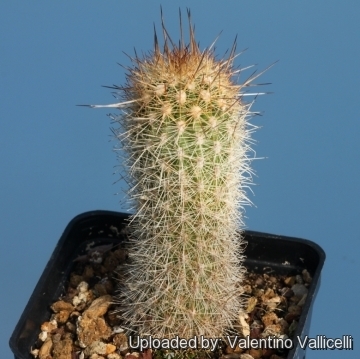 Accepted Scientific Name: Oreocereus leucotrichus (Phil.) Wagenkn. Origin and Habitat: South Peru (Ayacucho, Arequipa, Moquegua and Tacna) and north Chile (Arica y Parinacota, Tarapacá and Antofagasta regions). Altitude: 2000-4500 m of altitude. 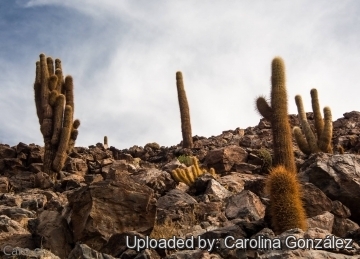 Habitat: It grows in shrubland on rocky stony soil of the Andean pre-cordillera, characterized by a cool and dry climate in winter, mild and little rainy in summer. The species is abundant and the species is overall stable. The species is locally threatened by illegal collection, but this is localized, and there are no major threats. Oreocereus hendriksenianus var. densilanatus Rauh & Backeb. 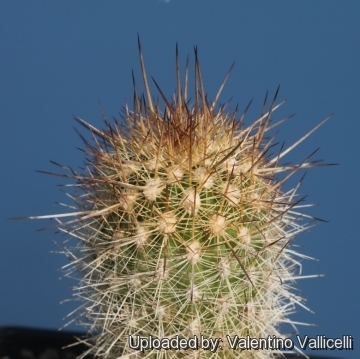 Oreocereus hendriksenianus var. spinosissimus Rauh & Backeb. 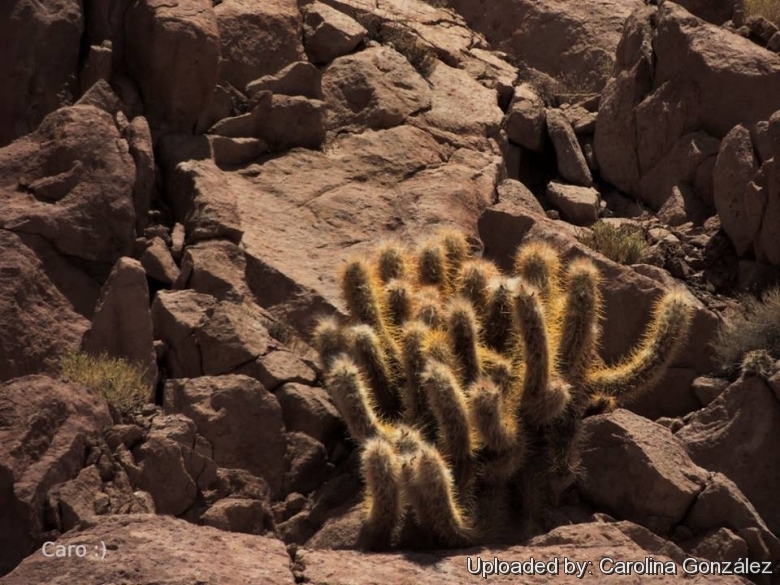 Description: Oreocereus leucotrichus is a small shrubby columnar cactus, forming dense broad clumps covered in spines. It is a much variable species. Stem: Solitary or (usually) branching basally, curved upward often prostrate and creeping, cylindrical with green to grey-green epidermis that grow to a height of approximately 60-200 cm, 6-12 cm in diameter. Ribs: 10 to 15(-20), closely set, flattened, with shallow cross-furrows. Areoles: Close together with abundant white to black silky hairs 5-10 cm long, thicker on the more recent vegetation. Spines: Stout, yellowish to maroon to orange, not becoming gray that often fall below as the plant gets old. Central spines: 1-4 about 2-8 cm long, gently curved, longer than radials. Radial spines: 5-10 to 15 mm long. Flowers: Diurnal borne in small groups near the stem tips, 5-10 cm long, and 3-5 cm wide, corolla with dark red or purple red tepals and several dark purple stamina. Floral tube slender, straight, or slightly curved, red with densely pilose areoles and small scales on the ovary. Fruits: Globose to somewhat elongate, reddish yellow to yellowish green, 2-6 cm in diameter, with thin epicarp (skin) and slightly acid pulp. 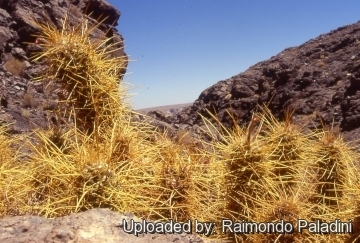 Taxonomic Notes: The species that was described as Oreocereus hendricksenianus in Arequipa is considered a different species by some authors. Oreocereus hendriksenianus Backeb. in Backeb. & F.M.Knuth: has about 10 ribs, the silky hair is white, but also yellowish, red-brown or even black, protruding through which are stout, brightly coloured spines. Distribution: Southern Peru, Northern Chile. Oreocereus leucotrichus (Phil.) Wagenkn. : Has 10-15 (or more) ribs covered with with abundant white to black silky hairs 5-10 cm long, thicker on the more recent vegetation. Distribution: Southern Peru, Northern Chile. 5) Cáceres, F., Faundez, L., Guerrero, P., Saldivia, P. & Walter, H.E. 2013. Oreocereus leucotrichus. The IUCN Red List of Threatened Species. Version 2015.2. <www.iucnredlist.org>. Downloaded on 11 August 2015. 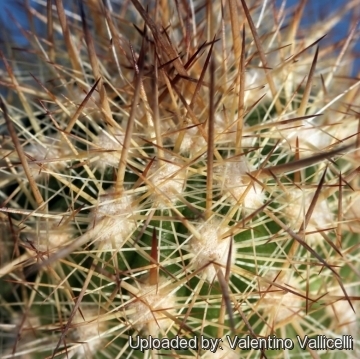 Cultivation and Propagation: This is a a much decorative frost hardy cactus that grow at high altitude and is suitable for small “desert” gardens, in association with other xerophytes. Where the open air cultivation is not possible due to the climate, it is to be cultivated in pot in order to shelter it in winter. Soil: Grow it in a rich and particularly draining substratum, as it is very sensitive to rottenness when in presence of humidity and low temperatures and let the soil dry out between waterings. Water: In summer, during the vegetative period, it must be regularly watered, but allowing the substratum to completely dry up before irrigating again; in winter, it’s to be kept dry. Hardines: Hardy to 7°, but tolerate temperatures down to -12°C for short periods if very dry. However in cultivation it is better not to expose it to below zero temperatures, especially if in presence of high atmospheric humidity. Exposure: It need full sun exposures. Manteinance: Repot in the spring, when their roots become cramped. Generally, they should be repotted every other year in order to provide fresh soil. After repotting, do not water for a week or more.